This week I did a PRINCE2 Foundation course. Nothing fancy, nothing new, just a load of common sense and things I have been doing right for a long time. But it's good to see it all presented in a well thought through structure. It allowed me to recognize mistakes I made in recent projects. Also, this standardized method will save me the trouble of having to re-invent the wheel at every step. And it will help me to 'sell' my approach if I can confidently say it is conform such a widely accepted method. Anyway, I think I will soon go for Practitioner as well. This video about Microsoft Research gives an interesting look into the (Microsoft) future. Turn off audio (just a load of marketing blabla) and watch. This article triggered me. How long have I been using Linux? I remembered using Slackware. I remembered it came in a red box of CD's (followed by a blue one). It must have been around 1995/96. But googling with those parameters did not get me anything. Than I remember my so-called 'nostalgia box' in our attic. A box with all sorts of clutter that I don't want to throw away for sentimental reasons. My first Linux distribution is one of the items. 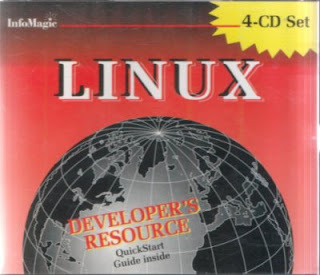 It turned out to be the August 1995 InfoMagic Linux Developer's Resource. A 4-CD Set containing Slackware 2.3 with kernel 1.2.8, and lots of sources and documentation (which were a revelation to me). So, I ended up in the top 16% of the oldest Linux users. I also remember it being a pain to install, from tar-balls, requiring a fair amount of technical knowledge, which I did not have at that time. But it was my entry into Linux and Open Source, it was new, and it was exciting. Want to know what is mainstream on Linux? Try this. The Easy to Learn, Easy to Work, Easy to Play, or EEE PC gets a lot of positive media intention attention. Except that the price is higher than expected: the 4G-surf version costs almost €300. That may not seem much, except when compared to the promised $200. That would have earned them the extra E for Easy to Pay. FON is not new (the company was founded in 2006 by Spanish millionaire Martin Varsavsky) but today was the first time I heard of it. Unknown to me, a new community has been growing world-wide. The idea is simple: instead of securing your Internet access against other users, you allow them access (through a special FON 'social' wireless router). And they allow you access to theirs. By simply sharing your Internet access at home, you get Internet access everywhere (at least, everywhere near to another 'Fonero'). Hence their motto: Share a little, gain a lot. The idea is so brilliantly simple, that you wonder why nobody thought of it before. The catch, of course, is that most Internet Service Providers (ISPs) do not allow connection sharing. But with investors like Google and Skype, they seem to be on the right track. And with the bonus of making while helping to build a community, FON will have a strong attraction to many. Struts is an open-source Java framework for building web applications. It uses existing technologies like servlets, JSP en AJAX. Struts encourages separation of concerns using the MVC design pattern. It achieves this through actions. Struts gets competition from Spring MVC (added to Spring because of Struts' perceived shortcomings) and Java Server Faces (added by Sun to Java Enterprise Edition 5). Examining this technology I came across the new Filters mechanism (not Struts-specific), which really appeals to me, because it mimics the UNIX pipes. It gives you a fine-grained, flexible way of re-combining existing functions, like logging, authenticating, and localization. This extension to the Servlet technology seems like a Good Thing to me. Spring is enterprise, a replacement of or addition to traditional J2EE. Spring is POJOs (Plain Old Java Object), so no EJBs (Enterprise Java Beans) in all sorts of flavours. Spring is Open Sources, so no licence fees. Spring is modular, so I can start with its JDBC template, and gradually introduce Dependency Injection (DI, better known as Inversion of Control), Aspect Oriented Programming (AOP) and enterprise service templates. I tried to learn EJBs. I really, truly did. Several times. Using different methods. But every time I am overwhelmed by the insurmountable heap of knowledge you need to get anything done. And instead of programming, you're constantly 'configuring' in unreadable, endless, and complicated XML files (and to make matters worse, this configuration depends largely on the brand of container you have chosen). There's plenty of tools to help you with these tedious tasks, but is the need for these tools not the best sign that something is seriously wrong with the architecture. Instead, Spring's inversion of control and modular design, allow me to program vanilla Java and selectively pick services from the container. Better still, if a good implementation of a service exists, Spring doesn't re-invent the wheel, but re-uses the implementation. That makes sense to me. That's the theory, anyway. Maybe I should give Spring a try? Ubuntu with a GNOME desktop is my OS of choice. But I have Vista as a boot alternative. Ubuntu provides everything I need, with one exception: exchange of Microsoft Office files. I can read and edit them with OpenOffice, but when I send them to Vista/MacOS-users I am in trouble: it almost works, but not quite. Favourite applications include Firefox, Thunderbird, and Eclipse. This may sound corny, but I choose Ubuntu because it feels light and airy. I feel in control. Comparing Ubuntu to Vista is like comparing Spyker to Lexus. I couldn't get my webcam to work until recently. When I tried Zapping the webcam LED went blue and suddenly I was looking at myself on-screen. Still, other applications don't do anything. The spam filtering under Thunderbird doesn't work properly. Spam is marked, but never moved to the Junk folder. This is a known bug. My WLAN connection breaks every so often. To be honest, I don't know if this is a problem of Ubuntu or of my hardware. When running Vista, I don't notice this problem. 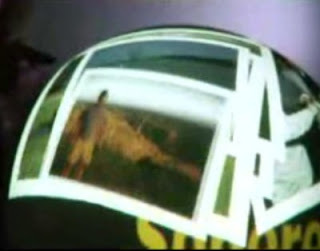 But then, under Vista a lot stays hidden from me. The suspend function doesn't work properly. When I close the lid, Ubuntu usually suspends. And when I open the lid again it usually resumes. Usually, but not always. This is also a known bug. The GNOME desktop is clean, simple, and 'light' (in the sense that it is not a thick fluffy obstacle between me and the functionality I am after). However, recently I got my hands on a MacBook Air. It not only looked magnificent on the outside, but on the inside as well. Especially the launchpad with its animated icons made it fun. This article shows how to give Ubuntu a Mac OS/X look. Just follow the recipe and your desktop will be transformed in no time. And combined with the wobbly windows of Compiz, you're desktop will have even more eye-candy than a Mac. Next to fun, the launchpad is practical as well. I always wanted to assign a fixed position on the task bar for my favourite apps. With AWN I get that. Better still, with the conventional panel, I had to remember if I had an instance of an application running. Now, AWM remembers that for me. So, to open Firefox, there's only one button and it's always in the same location. Simple. The jumping icons drove me mad. I made them glow instead. The AWN notification area is ugly, so I use trayer instead. Not the most beautiful solution, but as a compensation my workrave notifications work (which they never did in the GNOME panel). Have you noticed how web pages have become more responsive lately? No more tedious waiting for a page to load after you have clicked its link. Instead, the page reacts instantaneously to your input. This is Ajax at work. Like LAMP it is not a new technology, but a stack of existing ones. You cannot buy or download Ajax, but you can combine its composing technologies. Ajax uses these technologies to enhance the user experience on the web by bypassing the conventional request/response architecture of HTTP. On the surface, the Linux-deal between Microsoft and Novell was surpising. At first Microsoft tried to ignore OSS, than it tried to fight it, and now they seem to adopt it. But it turned out to be a strategic move about patents. Microsoft claims that RedHat Linux violates dozens of their patents. By threatening RedHat users, Microsoft hopes they will migrate to Novell's SuSE Linux. They claim that in China this approach is already proving to be succesful. To their credit, the patent-game is not the only result of this cooperation. They also work on interoperability between Microsoft and Linux environments. Which is something that could be very beneficial.